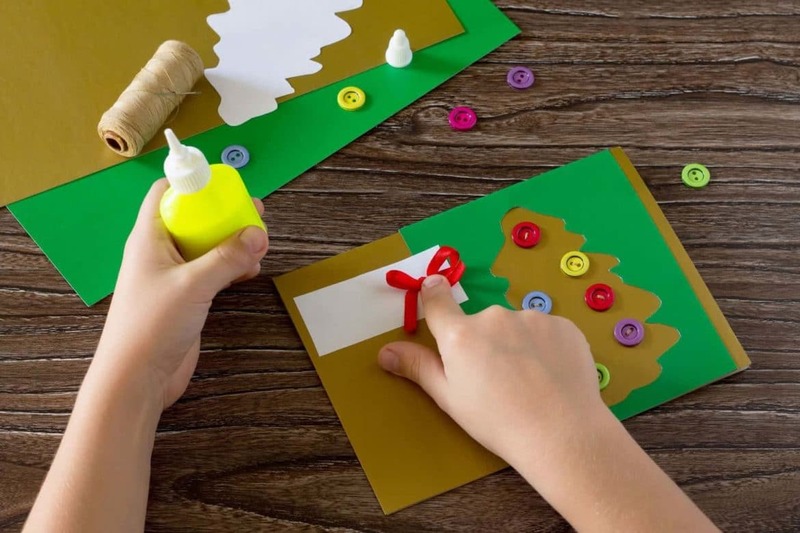 Over 130 Christmas Arts and Crafts ideas for preschoolers through second grade. All you need is cotton balls, pine cones, and felt pieces. Using Popsicle stick push cotton balls in the pine cones continue until you fill the whole pine cone, add eyes small beak and two felt feet and you have baby snow owls. You can add a pipe cleaner wrapped around it and you have an ornament. You start out with a cut out photo of the childs head, a triangle cut out of white poster board (about 4 or 5 inches tall), a silver ink pad (paint will work too), silver pipe cleaner, and crayons or markers. Let the child decorate the triangle however they want, or for older children, they can write a little poem or message to their parents, grand-parents etc… Then you have them make two little handprints on separate white paper with the ink or paint. glue the handprints to the sides of triangle to make wings, and glue the photo to the top of the triangle. Use the pipe cleaner to make a halo, and hook for the tree (you can also forget the hook idea, and add a magnet to the back instead) This was a huge hit. My 2 year old daughter and I made them last year for her grand-parents for Christmas. We had tons of fun, and she is still so proud of them. A real cute Advent Star for the countdown to Christmas for young children. Make a star with a slit just below the center. Have children make 24 paper chains (if starting on Dec. 1) Attach paper chain to center of star and add the following poem. Each evening after prayers are said, take off one ring and jump in bed. When only the star is left to shine, then you’ll know its Christmas time. I don’t remember where I found this cute idea but it was a hit in my preschool program for 20 years. Mix powder paint thinly, pour into ice-cube trays, insert lolly sticks & freeze overnight. Instant paint on a stick! Messy but great fun, try pastels for Spring, orange & black for Halloween or red, green & gold for Christmas. “These aren’t just 5 snowmen as anyone can see. I’ve made them with my hand which is part of me! Now each year when you trim the tree you’ll look back and recall the Christmas of (year) when I was just this small! More handprint variations for infants and toddlers. Make one footprint (white). With toes at the bottom, put handprints on either side for angel wings (gold, silver, yellow or white). I make a glittering halo. Put red paint on hand near the wrist and on the thumb, peach/pink in the middle of palm and white on fingers. The white forms Santa’s beard, the peach/pink his face and the red his cap. Embellish face as you desire. We made Christmas tree sun catchers as one of our gifts this year. We took a square of leftover laminate and used our handprint to make a Christmas tree on it. Paint the tree upside down with fingers away from the child to make it easier. Then the children used their fingertip to paint lights. We cut out a frame and glued it on. I allowed it to just dry and then laminated it.